Among his fellow Night Walkers, Erebus was called “the Insatiable One.” To his servants, he was known as “Erebus the Decadent.” His victims called him “Monster,” which, though accurate, seemed to him to lack a certain flair. To Lord Erebus, there was something unseemly about forgetting the delicious poetry in things, and he dealt with all matters — eating, partying, torture (often, the three were the same) — with an experimental, even artistic, joie de vivre. The Night Walkers drank blood and moved only in darkness. Erebus was different from the start, and for this he was celebrated: he could move in daylight, he could move about without touching the ground, and he could kill from a distance. All these powers came at a price, however. He was from the beginning possessed by a deep and unappeasable hunger. His mother offered the infant Erebus her jugular, as was customary among Night Walkers, but he nursed beyond her capacity to give, killing her only minutes after his birth. For a time, he was held in a separate cave from the others and fed whole cattle. It was only after he had ranged beyond the buried labyrinth of the Night Walkers and seen the machines of humans that he devised a means of controlling, if not curbing, his appetites. 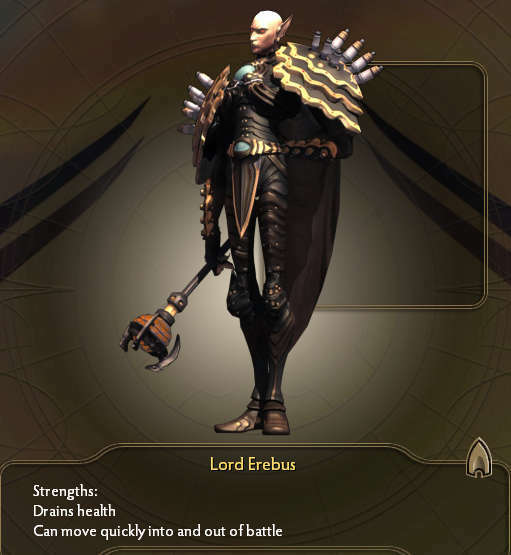 Lord Erebus built for himself a special suit, its interior lined with syringes, like an iron maiden. These fed his veins continuously, and the suit could be recharged with new blood through valves in its shoulders. Freed from his never-ending preoccupation with eating, the teen-aged Erebus looked on the savage, instinct-driven creature that he had been and was filled with embarrassment. After he had established himself as the uncontested Lord of the Night Walkers, he vowed to refine himself, to learn to appreciate subtleties, to become, as much as it was possible for a blood-drinking creature of the night to be, cultured. Now that he could drink it for pleasure only, he cultivated a nuanced taste for different kinds of blood. He categorized them not only by species — even the crudest Night Walker could tell the difference between, say, wolf’s blood and fox’s blood — but by the mood of the donor during extraction. “This bottle, for example,” he explained to an uncomprehending servant, “was drawn from a girl who was told her parents had just died. Here, taste.” The servant detected only that the fluid was, in fact, blood. Erebus continued: “Can you detect the bitter notes of despair, just beneath that slightly fructiform innocence? Ah, magnificent! A jewel of my collection!” His blood cellar was a thing to behold, with thousands of casks of every vintage lining its walls. Still, Erebus was unsatisfied. He had no peer among his people, no-one with whom to share his aesthetic triumphs. On many nights, he would dissipate himself and travel in mist form to faraway Nordolath, where human aristocrats had raised great halls. He looked upon their paintings, heard the music they played at their great balls, saw their splendid clothing, and was seduced by their sophistication. As might have been predicted, this longing found its most vivid expression in an obsession with a radiantly beautiful black-haired girl. The awe and desire that he felt while watching her from the shadows of her boudoir were all the keener because he knew he must not touch her. Not because he couldn’t — he could easily have taken her and sucked her dry — but because her delicacy and intelligence were the things that moved him, and these things would vanish in the tasting. She wrote and recited poems of such beauty that he found himself weeping blood. He dreamed of touching her long black hair, just once. One evening, while taking his usual bath in a vat of sheep’s blood, Erebus realized that he loved the girl. He decided to reveal himself to her, to prove to her that he was capable of appreciating her, and to woo her with poetry of his own. He decided he would wait until after they were married to tell her about the blood cellar. The following night, he stepped from the shadows of her bedroom and introduced himself. She immediately screamed, which for some reason he hadn’t anticipated. He went ahead with the plan, producing a piece of paper. Now there was pounding at her door, shouting guards beyond. Also, more screaming from the girl. A crash as the guards hit the door with something heavy. The girl drew in a great, ragged breath, and then went back to screaming. When the guards finally broke through, they found the girl cowering beneath her bedsheets. A towering, bald-headed creature stood at the foot of her bed, looking confusedly at a piece of paper. They immediately thrust their halberds at Erebus, who easily parried them. Not wishing to unduly frighten the girl, he did not kill the guards, but continued to beseech open-mindedness on her part while swerving and dancing to avoid his attackers. Even as he said the words, his red eyes began to whiten. The girl remained where she sat, frozen with fear. “You… must go…,” said Erebus, struggling with his quickly-rising hunger. He could feel his conscious mind shrink beneath an expanding, wordless bloodlust. After repairing his suit and wasting many months on a period of unseemly mourning, Erebus finally acknowledged that eternal boredom was likely to be his lot in life. Perhaps he could write a poem about the whole thing. He had to admit, even as he despised himself for it, that the girl had been delicious.